Agilent Technologies has introduced system impairments analysis for chromatic dispersion (CD) and first-order polarization mode dispersion (PMD) with the N4391A optical modulation analysers. The new tools allow system engineers, the ability to characterize distortions of constellation diagrams caused by the CD or PMD of an optical link. 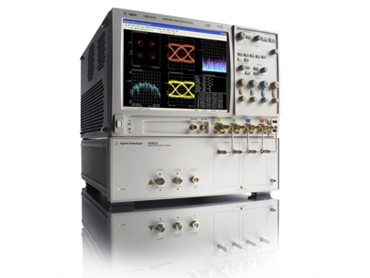 The N4391A optical modulation analysers offer comprehensive tools to analyze and quantify the signal integrity of a vector modulated signal (e.g., error vector magnitude and quadrature error). The N4391A optical modulation analyser offers measurement and compensation of the link's CD and first order PMD by analyzing the received signals, offering engineers deep-insight into the root cause of constellation distortions. The CD and PMD compensation helps system researchers and engineers to quantify their signal quality along the link and down to the receiver input. For greater flexibility of data analysis, customers can include their algorithms in the burst-mode processing system of the N4391A optical modulation analysers. The N4391A can handle any number of user algorithms in a user-selectable sequence. In order to offer the high flexibility to the user, the raw digitized data coming from the N4391A optical modulation analysers's optical coherent receiver can be processed using Microsoft's .NET(r) framework and included as a user-provided library.